Both soaproot and soapnut are amazing plants. They contain all-natural surfactants that can create suds with the mere addition of water and a bit of agitation. These suds are quite useful for cleaning things - even laundry. But since LisaLise is (mostly) about skin and hair care, we're going to learn how to cleanse our hair and scalp with soaproot, soapnut or even both! Both of these products are as basic as can be – simple, budget-friendly decoctions that are easy to make. You may have noticed the label on both of the bottles reads 'cleanser' and not 'shampoo'. There is a reason. Neither of these come close to behaving like a commercially manufactured shampoo (no rich sudsy lather to play with). They do make a bit of foam, but the truth is, they are both lather-less. Despite this, they both rock at cleansing all types of hair and scalp in a gentle and effective manner, and have become quite a hit in my home. And, if your hair usually feels stripped or dry after shampooing, you may just love this gentle alternative. 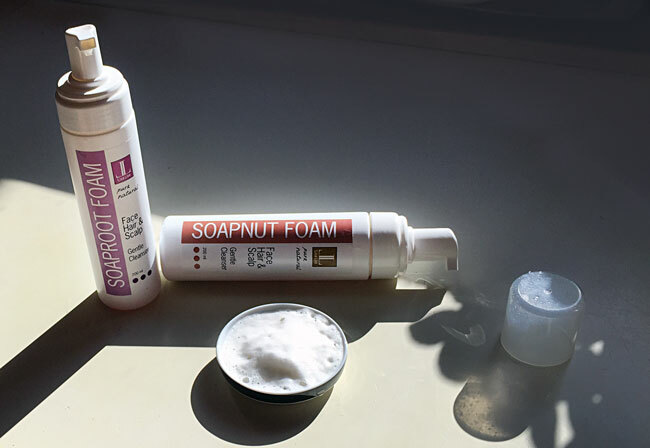 Since both soaproot and soapnut are lather-less, they both require a slightly different method of use. Here's the method I found best. It's not necessary to use a lathery product to cleanse the hair, but it might take a bit of getting used to. If you package either of these in a foam bottle, you will be able to start your scalp-cleansing experience with a handful of foam. It will quickly turn to liquid upon application, but you might find it easier to distribute this way. If you package in a squeezy bottle, you can apply directly to the scalp. Both methods work, so it's purely a question of preference. Dosage is also a question of preference. With both soaproot and soapnut - the more you apply and the longer you let it sit, the more cleansing power you will get. Take special care to keep the liquid away from the eye area, as both of these have serious eye-stinging ability. Work your way around the scalp and through the hair just as you would using a shampoo. The longer the time, the more cleansing power. This is something you will have to experiment with until you find what your hair prefers. If you try a squeak test at this point, you'll get an idea of whether or not you want to repeat steps 2-4. This is optional, but a lovely way to finish. A final rinse can be of your own making (vinegar rinse, hydrosol rinse, rosemary rinse, etc), or can be as simple as using demineralised water. A final rinse leaves hair soft and manageable. Enjoy your lovely clean hair! Have you ever used either of these to cleanse your hair? What were your experiences? Please feel free to leave a comment below. Your soaproot and soapnut research is fascinating Lise! I do wish I had more time to try and do the same. I must say I love a shampoo that lathers and I wash my hair every day as my hair is very fine and I look like a troll when I wake up in the morning :-o Also, I am so used to the "clean" feeling that I just feel really dirty and yucky if I dont wash my hair. I am guessing you are using the cleaner "neat" to test it, just with a preservative? Maybe the next version will have some interesting additives? I also love shampoo and I have to admit I'm addicted to solid shampoo, which I make with 1 part detergent and 1 part clay (and other little things...). However, I think that you decoction may work also like a dream as a face cleanser. Don't you think? Hi, i would advise u to try another thing with soapnuts. Roast them on a candle flame and drop them into water. Boil just once and then squeeze out all the saponin.add more warm water enough to wash hair thoroughly. rinse off with cold water to get the best results. i usually let them roast a little longer, to save cooking for a long time. they get almost burnt up and work great. Hi Maria - I live your solid shampoo idea-- This is one product I have never made and would live to try-- another one for the to-do list! Can Caffeine Make Hair Grow?